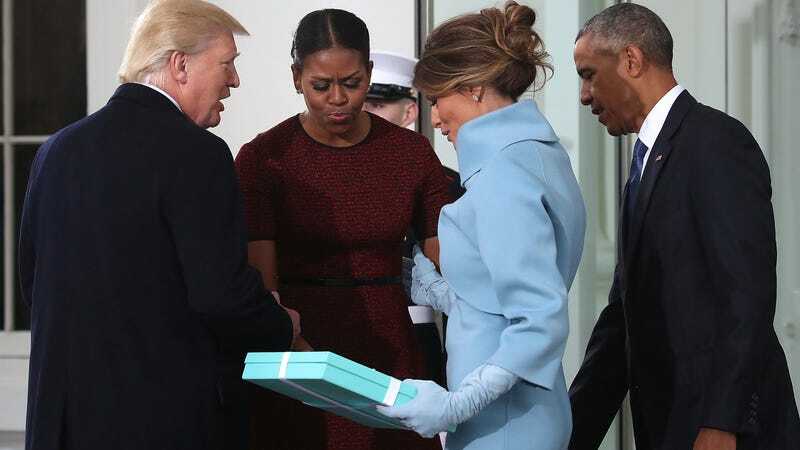 What Was In That Giant, Stupid Tiffany's Box Melania Gave Michelle? Well, it happened. As the end of good things began, President Barack Obama and his wife Michelle—a First Lady we never deserved but who served us and loved us nonetheless—welcomed an unqualified white man and his Jackie O impersonator wife to succeed them. The Jackie O impersonator thanked the Obamas for their Christ-like civility with a gift. Now, this is not strange. Michelle Obama also brought Laura Bush a gift before the 2009 inauguration. However, as is often the difference between these two couples, when Michelle brought a gift, it was decidedly less tacky. The Jackie O impersonator opted to give Michelle a very large Tiffany’s box because, the working class man, common folk, etc etc. If absolutely nothing else, the gift gave us some very good internet. So now the question remains: What the hell is in that dumb box? Whatever it is, we know Michelle handed it off to Barack, who then handed it off some aide. My dream is that she never even bothers to open it, but Michelle is too gracious for that. From the size alone, it could be an expensive picture frame, perhaps with an iconic image from the Obama presidency. But that would be too thoughtful for these people. A set of salad serving utensils? I don’t know and I will probably only care for the next 45 minutes or so. What do you think?